Hmm, a bit of a gap between this post and the last. Well, it was the Christmas season and I had other things on my mind and I’m sure that everyone else did too. Inspired by the drawing that I included in the previous post I took to sketching out some more to see where things would go. I had a head full of thoughts and ideas but it was all very unstructured and lacked a certain amount of direction. At least I was making images though, which pleased me. here’s a group of three sketches that quickly followed. These I just quickly photographed from the sketch book, hence the slightly shaded appearance towards the base of the picture. Seeing these it quickly struck me that I needed to get the pictures out of the sketchbook and onto individual sheets, to give each image a kind of home and to help me to start to organise what I was trying to do. The pages of my sketchbook were starting to resemble a rubbish tip. I had just hit the page with any and every idea I had and as a consequence I’d ended up with a giant tangle of bits and pieces from which I was finding it hard to pull bits that I wanted to work on further. So getting to separate sheets of paper seemed to make sense. I wasn’t anticipating what happened next. I pulled out some ideas and started to draw them up, and found myself going into a huge amount of detail. It was as if I’d subconsciously decided that I was going to design bikes for real and spent absolutely ages agonising over what I was creating. The drawings weren’t bad, no, but I worried that I would lose something or that they would become a little sterile. You can see from this next image that it’s a long way from what was happening previously. I actually really like this image and there are couple more like it which I’ll show next time because they really do illustrate the odd drift back towards realism. They also highlight another distraction which reared its head, and I’ll get my thoughts about that together for the next post too. For info this drawing is again done in black Biro over a light pencil layout on A3 cartridge paper. 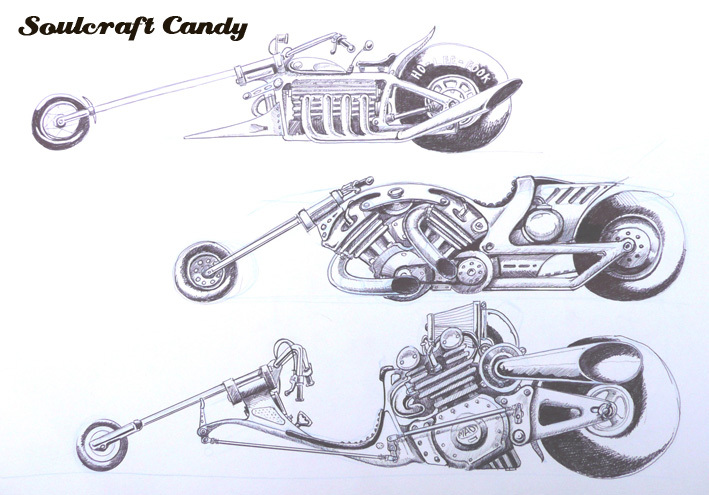 This entry was posted in Detail, Drawing by Soulcraftcandyman. Bookmark the permalink.